Have you ever read Dorothy Cannell? If not, you should really add her to your list of must reads. She's never failed to entertain me and make me laugh. In this “entertaining gothic tale” (Chicago Sun-Times) that “reads like Wuthering Heights on steroids” (Publishers Weekly), amateur sleuth Ellie Haskell gets caught up in the drama of a trio of ancient spinsters—and the ghosts of murder past. “Rosemary, Thora, and Jane lived at the end of the lane, one was thin, one was fat, and one was very plain.” This is how Ellie Haskell remembers her grandmother’s three childhood friends, known collectively as “the bridesmaids.” Ellie once asked her mother where the nickname came from and her mother replied, “It’s a long story, best forgotten.” After all, every family has its secrets. 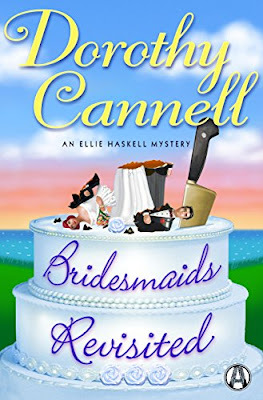 I discovered Dorothy Cannell and her creation, Ellie Haskell, years ago with The Thin Woman and was immediately hooked. Quirky characters, a touch of Ellie’s favorite gothic novels, humor, wit, and splendid puzzles rank them right at the top of my list beside Amelia Peabody. Simply reading the titles makes me smile. In BRIDESMAIDS REVISITED (ha J), Ellie and Ms. Malloy are on their lonesome at Merlin’s Court. Ben has thoughtfully taken the children to a new type of family vacation resort, Memory Lane. They’re springing up all over and this was the brainchild of their vicar’s wife. Ellie, during her time alone, is meant to be decorating little Rose’s room. She doesn’t even get into the room before she receives a letter from the past. Friends of her long gone grandmother, Sophia, have written to Ellie asking her to come visit the Old Rectory. Ellie remembers these older ladies from a childhood visit with her mother, Mina, who referred to them as The Bridesmaids. Despite her misgivings, Ellie heads off with Ms. Malloy aka Roxy, who’s on the run from Leonard, a husband who went out for stew beef and never returned. He’s turned up all these years later like a bad penny, and Ms. Malloy fears she’ll be too weak to resist his charms should she be left alone. What a hoot. In these days of dark leaning reads, regardless of genre, Ellie and crew are just the ticket to lighten up your day, and reading. With nods to past gothic classics Ellie and Ms. Malloy are off and running in their new adventure. While readers may figure out who, there’re always many layers to Ellie’s mysteries that often defy the reader to identify each and every one. That’s part of the charm of Ellie, Ben, Ms. Malloy, and Freddy. While it may seem simple on the surface, it never really is. BRIDESMAIDS REVISITED is no exception. Long on clues, misdirection’s, idiosyncratic characters, and the icy fingers of a past mystery that reaches into the future, I wasn’t disappointed. I laughed and puzzled my way along with Ellie to try and prevent more death and havoc. With a devilish twist at the end, BRIDESMAIDS REVISITED was all I’d hoped and then some. Full of hijinks, eccentric characters, and inventive plots that dovetail sweetly at the end, the Ellie Haskell books are bound to become favorites you’ll turn to time and again.